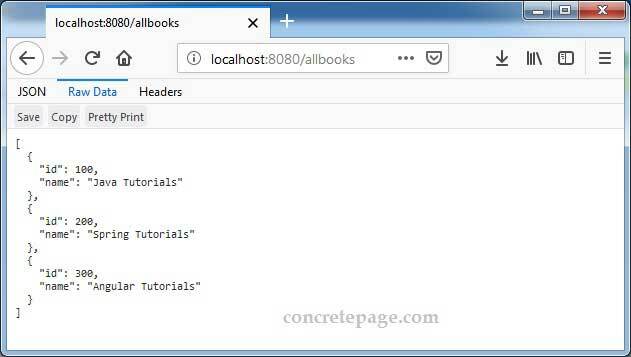 This page will walk through Spring Reactive REST API example. Spring WebFlux is Spring reactive-stack web framework introduced in Spring 5.0. Spring WebFlux is fully non-blocking, supports Reactive Streams back pressure, and runs on the servers such as Netty, Undertow, and Servlet 3.1+ containers. Spring WebFlux is introduced for non-blocking web stack to handle concurrency with a small number of threads and scale with fewer hardware resources. Reactor is the reactive library for Spring WebFlux whose operators are aligned with ReactiveX. Reactor provides following Publishers. Mono: A Reactive Steams Publisher that emits 0 to 1 element or an error. Flux: A Reactive Steams Publisher that emits 0 to N elements or an error. Mono and Flux uses operators that support non-blocking back pressure. Reactor focuses on server-side Java and has been developed in collaboration with Spring. Here on this page we will create Spring Reactive RESTful web services. We will create functional endpoints as well as annotated controllers for our REST application. Spring functional programming is the alternative of annotation-based programming. Spring WebFlux includes WebFlux.fn, a lightweight functional programming. It uses functions to route and handle requests and contracts are designed for immutability. To handle the requests we create handler functions and to route the requests to handler functions, we create router. Here we will create a Spring Boot Reactive REST API example using functional programming. Find the project structure. To work with Spring WebFlux, we need to resolve spring-boot-starter-webflux dependency. In WebFlux.fn, we create handler function to handle HTTP requests. Handler function takes ServerResponse and returns delayed ServerResponse as Mono<ServerResponse>. Find our handler function. Handler function is equivalent to the body of a @RequestMapping method in the annotation-based programming model. To route the requests to handler function, we need to create router function using RouterFunction. Router function is equivalent to @RequestMapping annotation. RouterFunctions.route() returns a builder to create router. We can also write above code as following. Find other files used in our demo application. Find the URLs to access web services of our demo application. Find the print screen of the output. Find the Maven file used in demo application. Spring WebFlux uses same annotation-based programming model as in Spring MVC using @Controller or @RestController annotations. Spring provides @EnableWebFlux to be annotated at JavaConfig class level with @Configuration annotation. @EnableWebFlux annotation imports Spring WebFlux configuration from WebFluxConfigurationSupport class in our configuration class. Here we will create a Spring Boot Reactive REST API example using annotated controller. 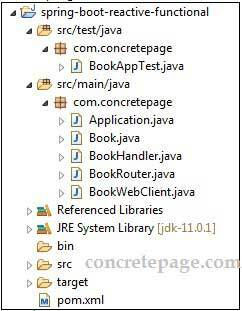 Find the JavaConfig used in our demo application. If we are not using Spring Boot, we need AbstractReactiveWebInitializer to deploy WAR to any Servlet 3.1 container. AbstractReactiveWebInitializer class wraps an HttpHandler with ServletHttpHandlerAdapter and registers that as a Servlet. We create the app initializer class extending AbstractReactiveWebInitializer as following. Spring WebFlux provides a reactive, non-blocking WebClient for HTTP requests. WebClient has functional, fluent reactive API to create client. Find the client code to consume RESTful web service in our demo application. To test the client application we can call it in our Application class as following. Find the output in console. Spring Test provides non-blocking, reactive WebTestClient to connect to a server over HTTP. WebTestClient uses reactive WebClient internally to provide fluent API to verify responses. Find the test class used in demo application.